For a lot of parents, getting their child to eat a healthy meal can be a challenge. A right of passage for many parents includes resorting to turning peas on a spoon into imaginary airplanes or spaceships to trick their kids into eating their veggies. The importance of eating healthy is no different when it comes to raising newborn animals. Luckily for Aquatic Biologist Jen Hazeres, getting Newport Aquarium’s six-month-old loggerhead sea turtle to have a well-rounded and nutritious meal is easy peasy. Check out this video of our young loggerhead devouring her breakfast within 60 seconds. In the video, the baby loggerhead was eating a piece of Mazuri Sea Turtle Gel made specifically for carnivorous turtles. When mixed with water, the gel hardens into a clay-like substance. Based on how fast she eats these chunks, it must be pretty tasty. The ingredients include salmon meal, fish meal, fish oil, squid meal and a ton of vitamins to supplement her growth and immune system. As you can see from the video, it’s quite an ordeal for her to eat because her buoyancy does not allow her to remain at the bottom of the tank for very long. This is why it is crucial that she continues to progress with adding weight. During her weigh-in on Jan. 20, she tipped the scale at 597 grams (or about 1.3 pounds), which is 69 more grams from the previous week. Not only is she gaining mass, she’s also getting larger as her shell, front to back, measured slightly more than six inches long, and almost 4.75 inches from side to side. 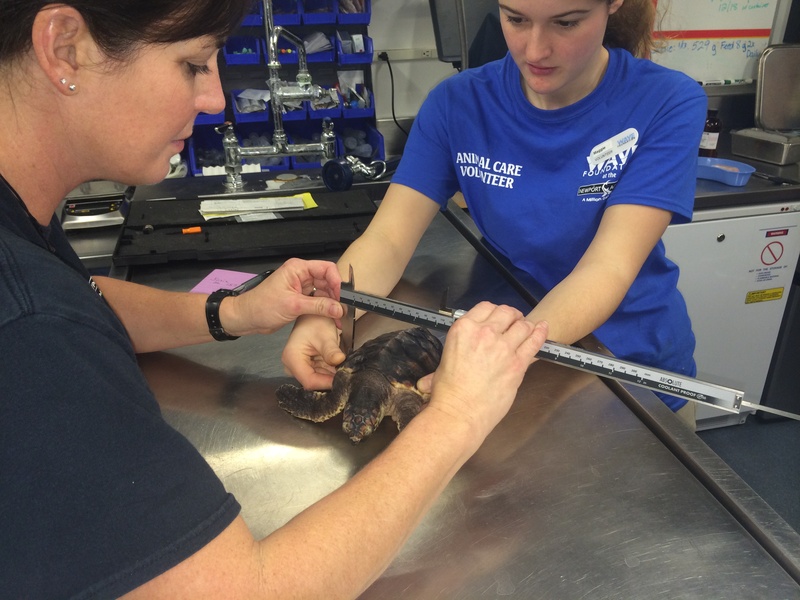 Aquatic Biologist Jen Hazeres (left) takes the young sea turtle’s measurements. It’s little wonder this young loggerhead is not shy about eating as she has shown a natural pension to put her mouth on anything in her sight when she’s curious or excited. One of the funniest sites featuring this particular sea turtle is when Hazeres and her assistants clean out her tank. They use a small, clear water hose to siphon out dirt and feces and oftentimes the mischievous loggerhead spots the hose and immediately begins to chew on it, delaying the entire cleaning process. 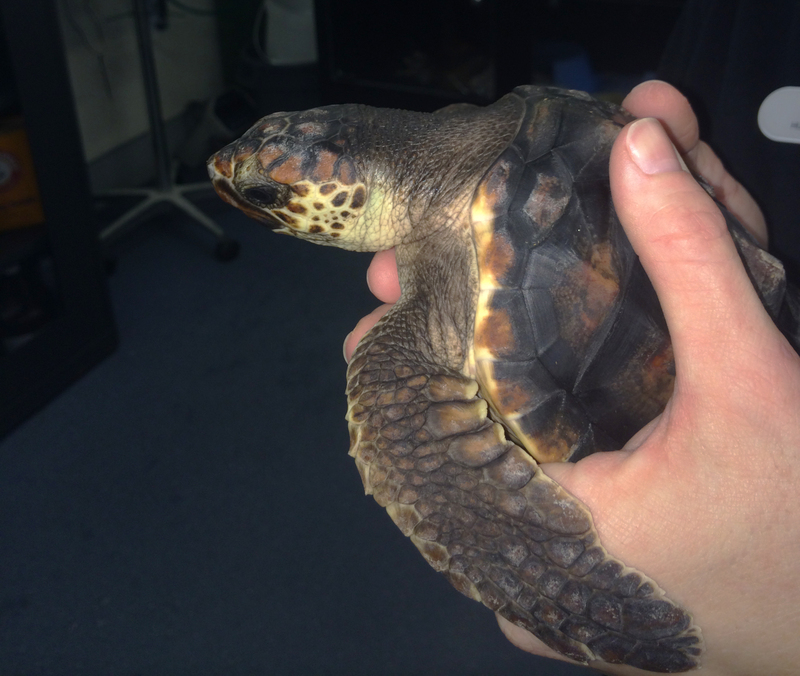 This entry was posted in Turtles and tagged loggerhead, Sea Turtles, Turtle Tuesday, turtles by NewportAquarium. Bookmark the permalink.